Even though last week I unintentionally abandoned regional foods, I’m a little bit glad it happened. In addition to the kombu, I bought some nori sheets. I have dozens in my cupboard now and am remembering how versatile they are. I made a batch of Chie’s sushi rice at long last and can’t believe the difference it makes. Nori rolls have been my lunch of choice all week. 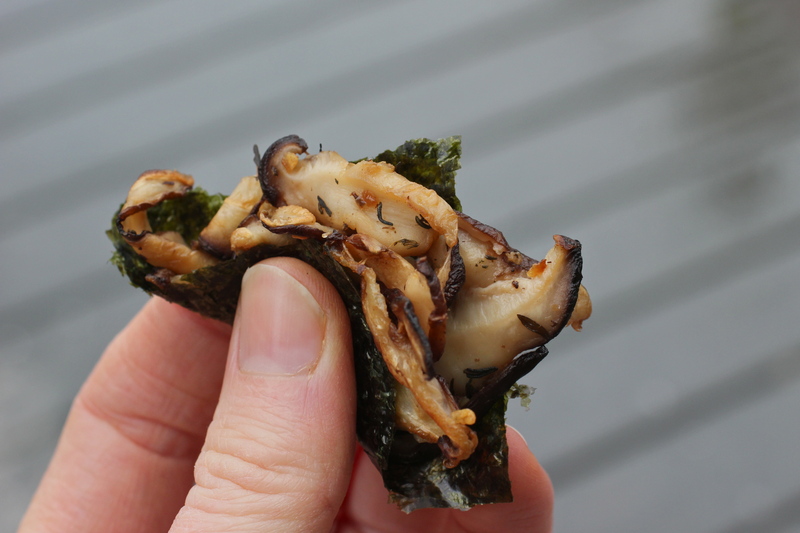 Did you know they’re good filled with nothing more than a dab of last’s week’s furikake? Yesterday I didn’t eat nori rolls, though. Instead, I broke out all my cast iron to make up today’s meal. 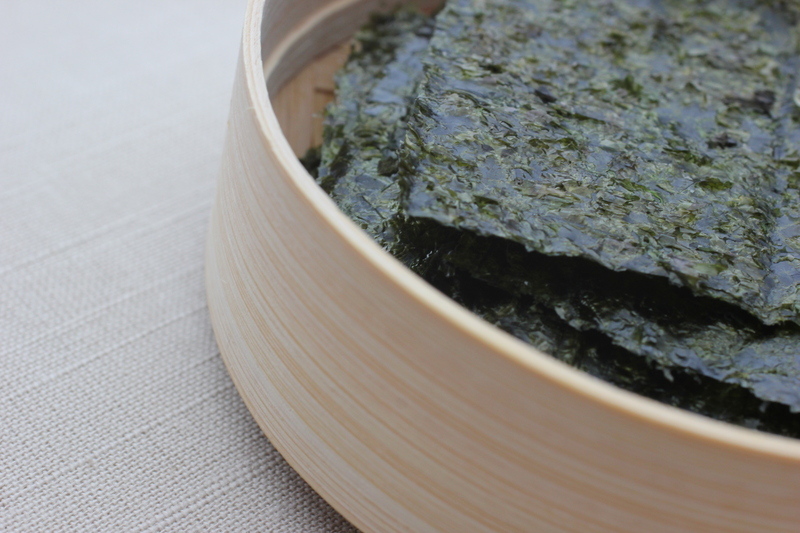 For the end of our sea vegetable series, we’re using nori as a jumping-off point to enjoy local foods in a pinchy pocket spread. What is a pinchy pocket? A small square of nori used, like injera, to grab bits of appetizers in a tapas-like approach to feasting. I dined alone yesterday but I can see, as Chie notes below, that this is a good contender for a kid meal. It’s a fun way to eat. Something I appreciate since the two smaller ones around here seem to have forgotten that they’re adventurous eaters. 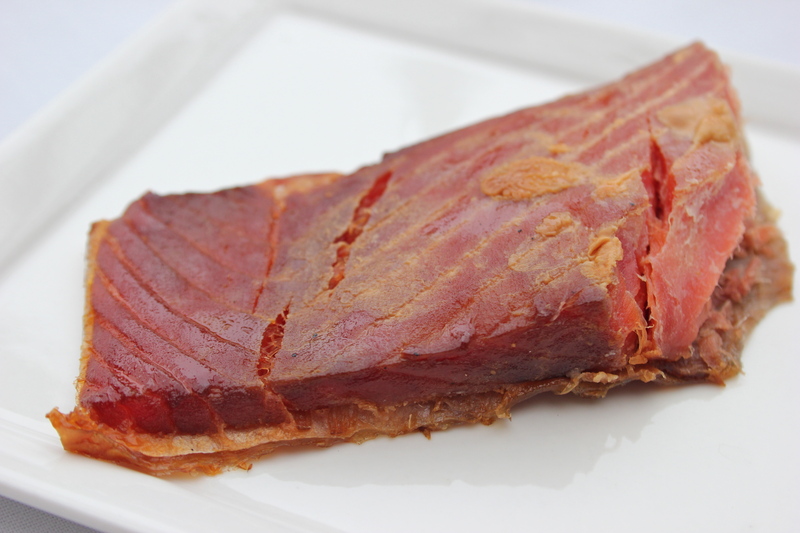 When I saw smoked salmon on the list of possibilities, I took my son down to Olympia Seafood and picked up this smoked Coho from just up the road in Westport. Then I had the bug. 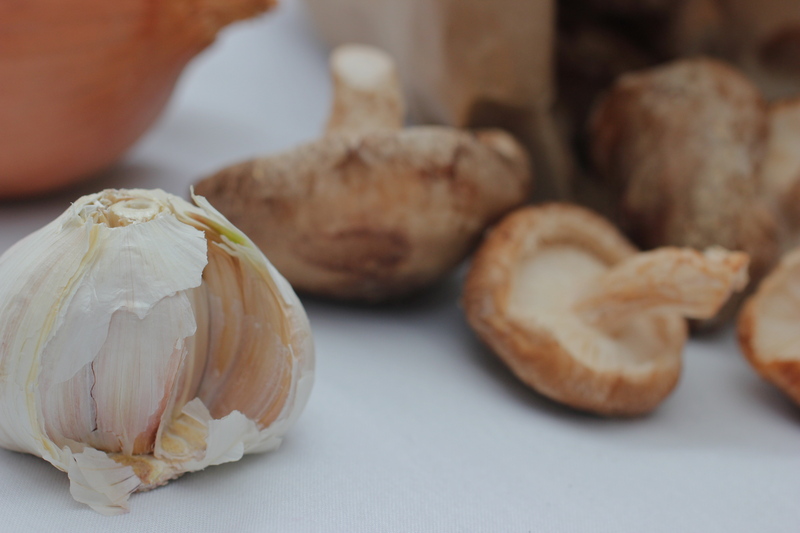 We made a special stop to pick up some of Steamboat Island Goat Farm’s goat cheddar and Alpine Mushroom Company’s shiitake mushrooms. Feeling properly outfitted with South Soun goodies, I planned a miniature menu from Chie’s suggestions: sautéed shiitakes, smoked salmon and (very lightly) caramelized carrots and onions sprinkled with cheddar. I ate much more than the three little dabs on the finished plate below. Wiped out the skillets, in fact. Make five or six appetizers and you’ll fill up bellies all around the table. 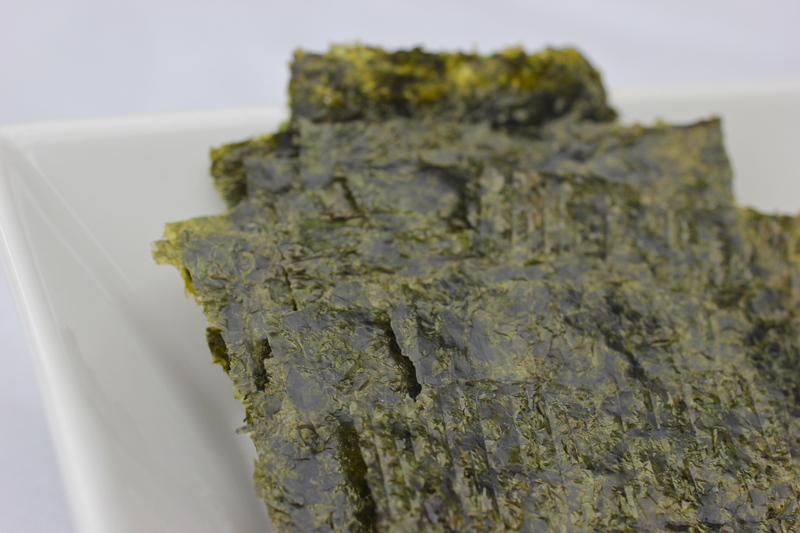 with a square of nori and pop it in your mouth. Quinoa, peas, ghee and sea salt. I sometimes add chopped flat leaf parsley. Fold the lightly cooked peas into quinoa cooked with a dash of ghee. Smoked salmon and lettuce. 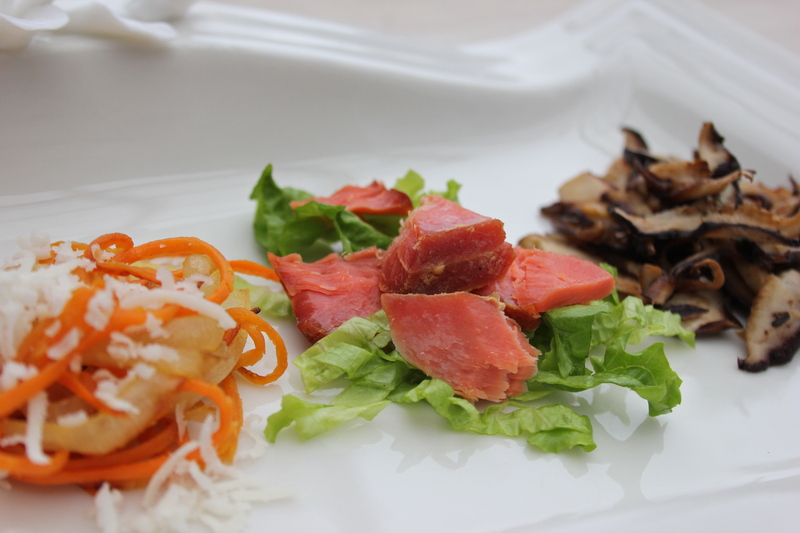 Mix chunks of smoked salmon with bite-sized pieces of lettuce, or arrange on a bed of shredded lettuce. 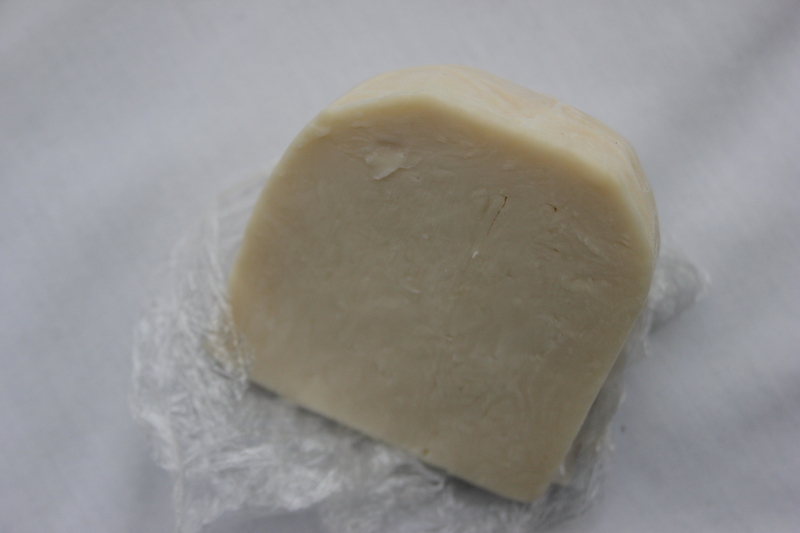 Goat cheese and basil. Form goat cheese into small balls and wrap in a basil leaf. Carmelized onions and carrots with white cheddar. 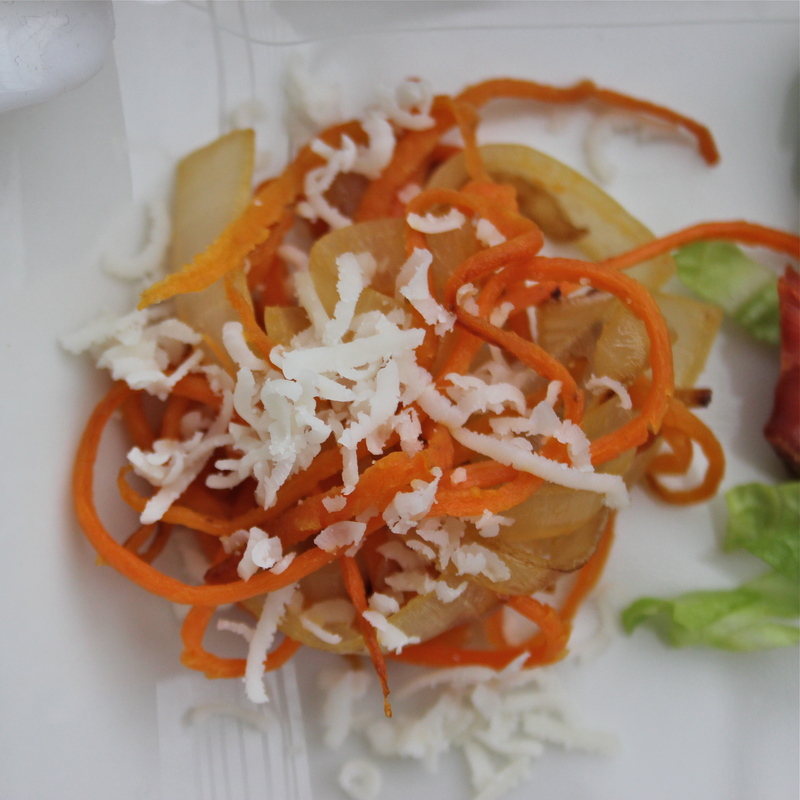 Sauté long carrot and onion strips until lightly carmelized. Sprinkle with finely shredded cheddar. Lettuce and natto miso with summer cucumbers. 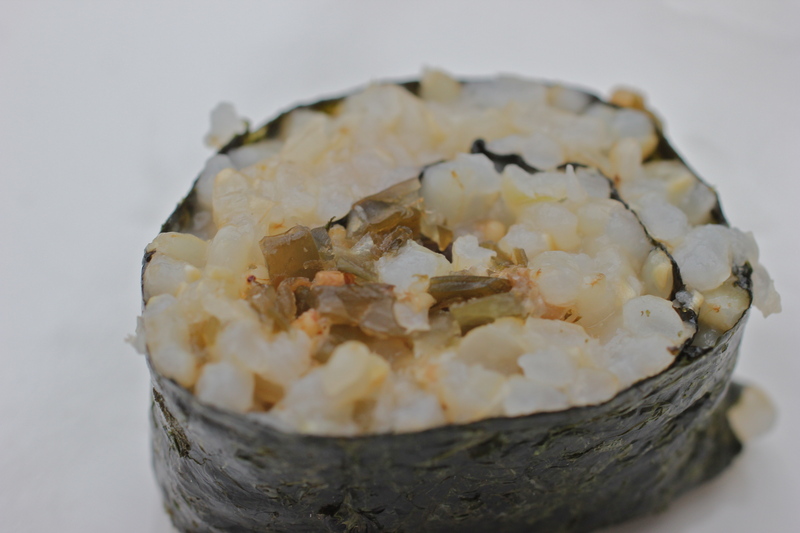 Naturally sweet, natto miso is a barley- and soy bean-based, non-pureéd miso eaten as a condiment. Mix with shredded lettuce and finely diced cucumbers. 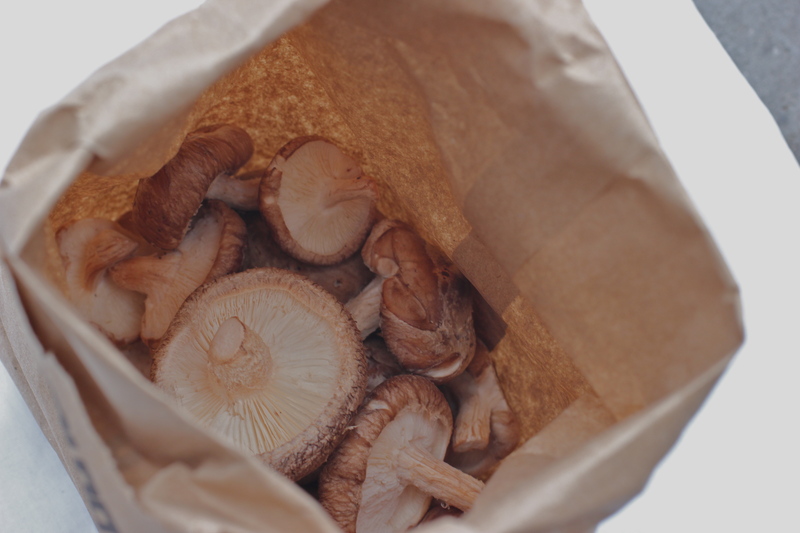 Sautéed shiitake or crimini mushrooms with sherry, fresh thyme and garlic. Kale with sesame tamari sauce. Create your own fillings and pinch away. I hope you enjoy it as much as we do! This entry was posted in Recipes, Seafoods, Winter Vegetables and tagged Butter, Carrot, Cheddar, Garlic, Lettuce, Mushroom, Onion, Salmon, Seaweed, Thyme. Bookmark the permalink. Sending link to my foodie-hubby right now. Think he’ll get the hint? I hope so, Julie – may you be treated to a feast some evening very soon! Glad you like it – thanks, Pat! I always seem to have extra nori lying around; I love this idea! Perfect – let me know if you try it out. Thank you for stopping by. And I love the concept of your blog. Nothing like a home-cooked meal for 96 cents! Beautiful food photography!! And I agree, those little snacks would be so much more fun to eat than with the old fork!! Why thank you, Smidge. Yes, no boring eating allowed!